I‘ve been working through a book I found at the Family History Library called Marriage and Death Notices from Extant Asheville, N. C. Newspapers 1840-1870 An Index, going through page by page and analyzing the information found. Today, I reviewed several pages, which included Alexander, Brooksher, Burgin, Cunningham, Davidson, Deboard, Hemphill, and Lytle (there were more names, but these are the surnames of interest to me). Extracts are in bold below. Comment: “H.M.” refers to the Highland Messenger, “Asheville’s first known newspaper, published from June 5, 1840, until sometime between August 17, 1848 and September 27, 1849.” Sophronia’s father, George C., was a son of James Alexander and Rhoda Cunningham. I have Pattons in western North Carolina, as well. I do not know who Calvin is at this time, but I expect he will turn out to be connected to my Pattons. Comment: “A.M.” refers to the Asheville Messenger, the successor paper to the Highland Messenger. It was “published from the 1848-1849 period noted above until at least as late as January, 1853.” I have Brookshires who lived in Wilkes County, which is a couple of counties away from Buncombe, also in western North Carolina. I don’t know at this time if N. W. is connected to my Brookshires. Comment: Alney is the son of John Burgin and Elizabeth Mann. He had an uncle named Alney, but the uncle was born in 1797, which doesn’t completely rule him out as the bridegroom, but makes it much more likely that this notice refers to Alney, the younger. Additionally, the younger Alney appears on the 1880 census with a wife named Drusilla, while the elder Alney died in 1868. Comment: “A. N. refers to the Asheville News, which was published between 9 Jan 1851 and 18 Nov 1869. At this time, I can’t identify Harriet or her father, (I have 10 John Burgins in my database and more than one is the right age to be Harriet’s father). Samuel could also turn out to be related, as I have Youngs from western North Carolina, as well. “CUNNINGHAM, Col. F. H., to Miss Jane Cairnes, Jan. 22, 1846, in Asheville (H. M., Jan. 30, 1846). Comment: A preliminary search on Ancestry.com indicates that Col. F. H. Cunningham is actually Enoch H. Cunningham, a great-grandson of Humphrey Cunningham and Rhoda Summerville (parents of Rhoda Cunningham who married James Alexander). If so, this puts him outside the scope of my research. The next three entries on this page appear to be his children, so I’m not going to list them. Comment: A preliminary search on Ancestry.com indicates that this is Allen Turner Davidson, a great-grandson of John Davidson and Mary Morrison, which also puts him outside the scope of my research. The next entry on the page appears to be his brother and all of the other Davidsons listed appear to be outside my scope, as well. Comment: I believe that George is the son of John Debord and Martha “Patsey” Edwards, making him the brother of my fourth great-grandmother Anna Debord, who married Hiram Searcy. Comment: James is the son of Andrew Hemphill and Catherine McDonald and grandson of Captain Thomas Hemphill and Mary Ann Mackie. This was his second marriage. Comment: Thomas is an elder brother of James from the previous entry. This was his second marriage, also. Comment: Matilda is a daughter of Millington Lytle and granddaughter of Captain Thomas Lytle. I knew who she had married from her father’s probate file, but did not know the date until this record. Comment: I don’t know yet who Minerva is; however I have other people who intermarried with McEntires and who moved from western North Carolina to the Franklin County, Georgia area. Source: Topkins, Robert M., compiler. 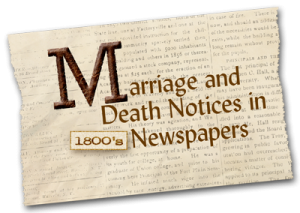 Marriage and Death Notices from Extant Asheville, N.C., Newspapers, 1840-1870: an index. Raleigh: North Carolina Genealogical Society, 1977. Cemetery Inscriptions of Buncombe County, N.C.: volume one and Cemetery Inscriptions of Buncombe County, N.C.: Volume Three. Look for these brides now that I have their married names.